Run-size estimates for Trinity River spring- and fall-run Chinook salmon, coho salmon, and adult fall-run steelhead are made annually above two mainstem Trinity River weir sites at Junction City and Willow Creek. Total adult run size includes harvest, natural area spawners (escapement), and hatchery spawners for the areas that are monitored. The spring Chinook salmon information does not include harvest that occurs below the weir or spawning that occurs in tributaries such as the South Fork Trinity River, North Fork Trinity River, and New River. Due to the mixing of naturally produced and hatchery produced Chinook salmon in the natural escapement, the escapement estimates and Program goals for natural escapement are not directly comparable. A 2009 assessment of survival of hatchery-origin juvenile coho salmon (Beeman et al. 2009) was done to compare survival in the Trinity River to the Klamath River and provide feedback on suitability of sections of the Trinity River for migrating coho smolts. 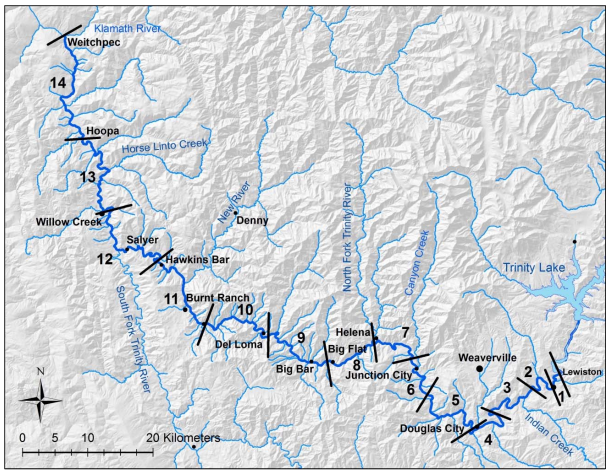 The probability of survival in the first 53 kilometers was lower than in the reaches farther downstream, which is similar to trends in juvenile coho salmon in the Klamath River. Nearly one-third of the Trinity River fish were estimated to have died within 10 kilometers of the hatchery release site, and one-half within the first 60 kilometers. Approximately 80% of mortality occurred in the upper river in the Trinity River Restoration project area. Coho Salmon spawner in Grass Valley Creek, a tributary to the Trinity River, photographed in 2012. The mainstem Trinity River is surveyed to recover salmonid carcasses, and to count and map Chinook and coho salmon redds. The distribution of Chinook salmon redds is expected to change in response to rehabilitation efforts of the Program, and the relative run size of natural versus Trinity River Hatchery origin fish. The USFWS posts regular updates on redd activity through the spawning season. Please visit http://www.fws.gov/arcata/fisheries/projectUpdates.html#SpawningSurveyData. Distribution of mainstem Trinity River natural-origin and hatchery-origin Chinook Salmon redds observed in 2016. Survey Day 1 = September 1, 2016 and Survey Day 120 = December 29, 2016. Distance from Lewiston Dam is in kilometers. Salmon redds and carcasses were surveyed on the mainstem Trinity River, from Lewiston Dam to the confluence of the Klamath River, during the 2012 to 2016 spawning seasons to map spawning distribution, evaluate pre-spawn mortality. Annual pre-spawn mortality of female Chinook salmon in the Trinity River restoration reach was 0.0% in 2015 and 0.8% in 2016. There was an observed increase in the mean distance from Lewiston Dam of natural-origin Chinook salmon redds. Between 2002 and 2012 the number of redds constructed by natural-origin Chinook salmon in the mainstem Trinity River varied with no significant trend, while the number of redds constructed by hatchery-origin Chinook salmon declined over this time frame. Survey Reaches between Lewiston Dam and Weitchpec on the mainstem Trinity River. Dangerous whitewater conditions precluded surveys in Reaches 8 and 11. Hatchery straying has been documented in the Trinity River basin by weirs on Manzanita Creek and South Fork Trinity. Studies on other river systems indicate that straying of adult hatchery salmonids causes ecological impact on natural populations. Distinct runs of spring and fall Chinook salmon were originally distinguished on the basis of time of run and spawning (see Kinziger 2010). 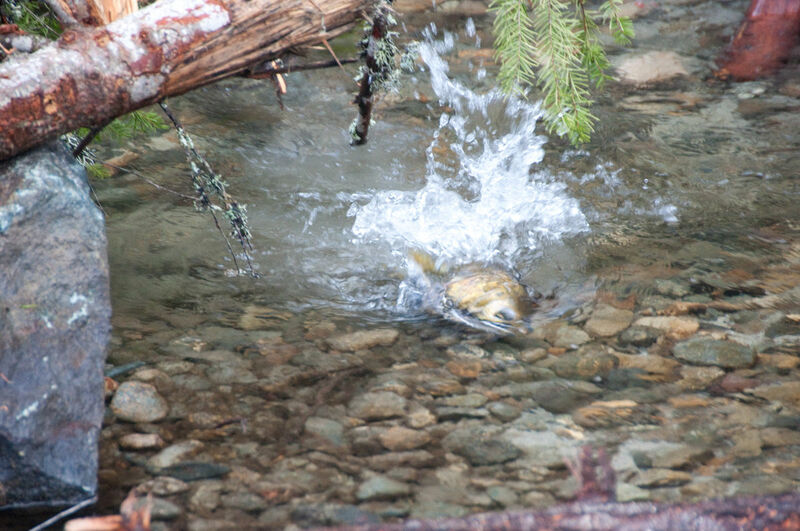 Fish are sampled from a variety of sources within the Trinity and Klamath Rivers. 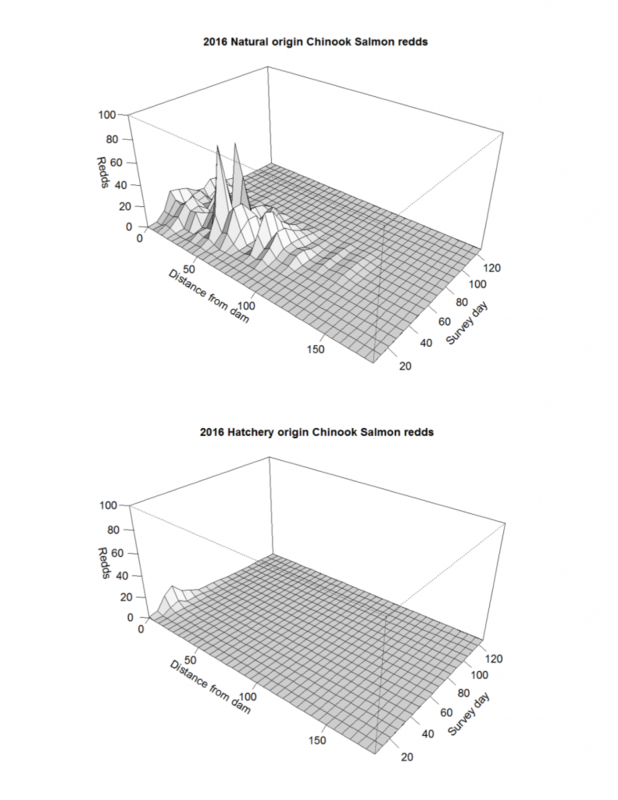 Although hybridization occurs, differences still occur in run timing for fall and spring hatchery Chinook. Recent in-river returns of Trinity River Hatchery (TRH) steelhead resulted in increased concern that the numbers of hatchery fish returning could negatively impact naturally produced steelhead in the mainstem and tributaries. In 2009, adult hatchery steelhead were tagged at TRH and at the Willow Creek weir. 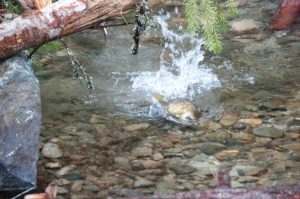 Hatchery steelhead were detected straying into Deadwood Creek, Rush Creek, Browns Creek, and the North Fork of the Trinity. Since the fall of 2003, the Yurok Tribe has monitored for disease among fall-run Chinook salmon in the Lower Klamath River with an emphasis on Ich and Columnaris— diseases caused by parasites that are believed to be endemic to the Klamath Basin. In general, healthy fish are resistant to Columnaris. Columnaris is observed among adult Chinook salmon in the Klamath River every year to some extent; whereas the outbreak of Ich in the Lower Klamath River during 2002 was unprecedented. Estimates of age-specific returns to hatcheries and spawning grounds, as well as harvest by Tribal and recreational fisheries are reported in the annual report on the Klamath River Fall Chinook Salmon Age-Specific Escapement, River Harvest, and Run Size Estimates (numbers also given in the “Mega Table“). The harvest in the Hoopa Tribal fishery and the Trinity River recreational fishery is composed of both naturally and hatchery produced fall Chinook salmon. The harvest in the Yurok Tribal fishery and the lower Klamath recreational fishery is composed of naturally produced Chinook salmon from both the Klamath and Trinity rivers, as well as the major tributaries to both rivers and Chinook salmon produced at Trinity River Hatchery and Iron Gate Hatchery on the Klamath River.